I am so happy with my Bath Mat set. I do need a rug that matches that is a little bigger. Hope I can find it with you. This product is a winner and I recommend it. Feels so good under my feet!!! Step out of your tub and into luxury with the 2 piece memory Foam Bath Mat Set by Windsor home. Featuring a soft and absorbent top layer of Jacquard fleece and a memory foam core bringing you maximum comfort while you dry off and get ready to start your day. Includes one over sized and one standard sized rug with fast drying bottom. Purchased these bath mats for my daughter who happens to be a college student. She was in need of bathroom mats and I thought that they would be very fitting based on the description. They did not disappoint. Very comfortable and good quality. She really likes them and only problem was that the color wasn't quite what she was looking for. We will probably return them, but we will only be returning to exchange for a more suitable color. ...I picked the wrong color for having kids and a dog! I wash them at least once a week because the off-white always looks wet. After I wash them, they look lumpy. I bought this along with the 24x59 inch memory foam extra long bath rug. They are so comfortable!!! We have these in our new RV. Based on the size of the RV, we were able to put one in the bathroom and the other in the kitchen. For the price, this was a great pair and I love the chocolate color. I would definitely suggest this product to a friend. The items were exactly as advertised, both rugs are attractive and look very nice in the bathroom. The price was right for me and I feel I got my money's worth. The rugs stay in place on the tile flooring. I think I got a bargain! Sizes are great! One for outside the shower and the other in the toilet room! Comfortable and looks like the picture. The thing I do not like is that the rubber on the bottom is not sufficient to make them stay put. They slide around a lot and I find myself constantly moving them back into position. They are nice to stand on though! The rugs slide a little on the tile. WARNING, the white is really cream. I though I could still use them, but they don't look great in the bathroom. Used them, so I won't return. Not as thick as I expected. Once you stand on them for a bit they become quite thin. Still, they look great and are very soft. Overall, I'm happy with the purchase. This memory foam bathroom set is awesome. I put in a washer and dryer and it came out great. I would definitely recommend this and will purchase again. Thanks! Words can’t explain the comfort of memory foam, especially on the feet. I love these because they feel really plush and soft! You can’t go wrong with this buy! These do exactly as described. My guys in the family luv them in their bathroom. No wet foot prints down the hallway anymore !! The also dry fast too. Easy to sweep clean also. Good value and very functional, too. This rug set is great for my 2nd bath. Pleasantly surprised with the rich color and cushioned feeling while walking out of the shower or getting ready in the morning and evening. 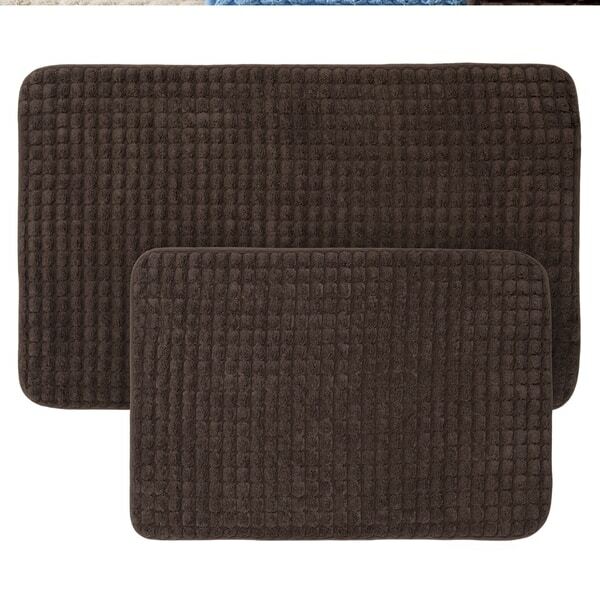 Great price and memory foam in bath mats.